We are close to eradicating a human disease for only the second time in history. A global public-private partnership has reduced the poliovirus caseload by 99.9% over the last 30 years, but there’s still plenty of work to do. Even before we reach that milestone, the knowledge and infrastructure built to fight polio is being repurposed to take on other global challenges. Fewer than 40 children were paralysed by polio in 2016, the lowest number in history. This is a dramatic decrease from the estimated 350,000 cases per year in 125 countries that the world saw in 1985 - the year that Rotary International initiated a worldwide effort to eradicate this terrible disease. In 1988, Rotary was joined in the effort by WHO, the U.S. Centers for Disease Control, UNICEF (and more recently the Gates Foundation) to create the Global Polio Eradication Initiative (GPEI). Today the virus is limited to a few areas in just three countries – Pakistan, Afghanistan and Nigeria. In response, Nigeria intensified surveillance activities to pinpoint where the virus is circulating. In Pakistan, innovative tactics are being used to focus polio immunization drives. Health workers are trained in the use of cellphone data reporting, which allows real-time recording of immunization coverage and public health surveys of populations. In Afghanistan, the program continues to adapt in order to reach the maximum number of children possible despite a volatile security situation. There are three different strains of the poliovirus. Once a strain is eliminated (type 2 was officially eradicated in September 2015), we have to match our vaccines to the remaining strains to protect children globally. This transition is a massive undertaking, requiring significant funding and coordination to accomplish global health feats that have never been attempted. 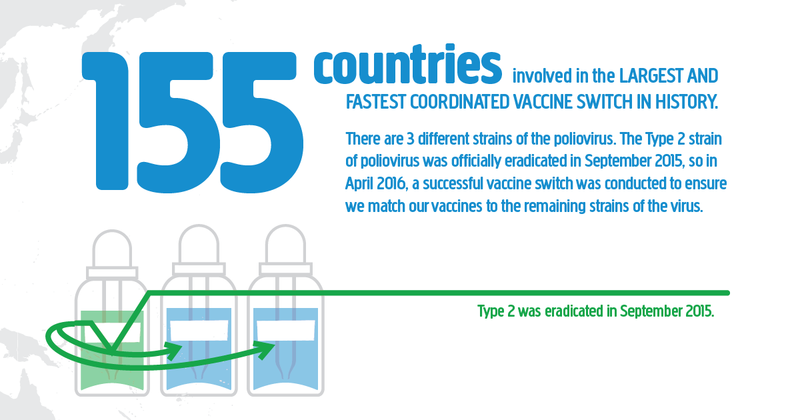 To give you a sense of scale, the largest and fastest globally coordinated vaccine switch in history (to target poliovirus types 1 and 3) was successfully conducted over two weeks in April 2016, with 155 countries taking part. 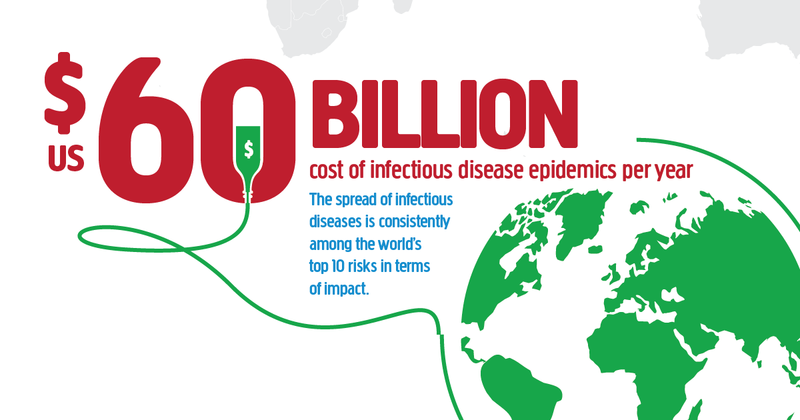 The spread of infectious diseases is consistently among the world’s top 10 risks in terms of impact. The eradication of polio will mean no child will ever be paralyzed by this debilitating disease again. However, we must use the knowledge and infrastructure built up over many years by the GPEI to take on other global health threats. 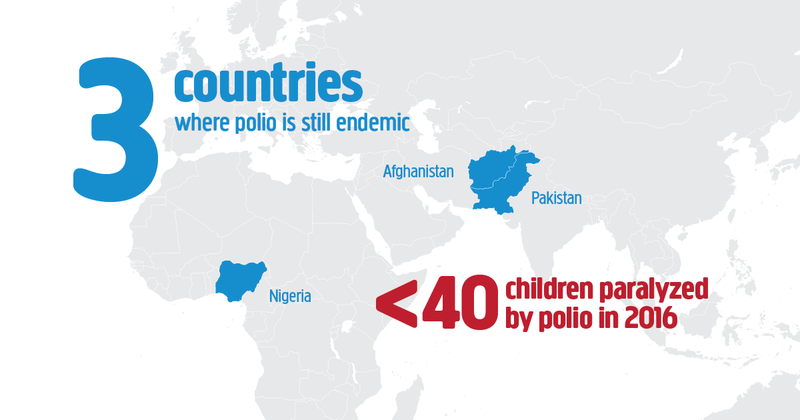 Dramatic progress on improving children’s health beyond polio is already underway – resulting in a decreasing number of children dying from other preventable diseases in countries with strong polio infrastructure. Polio drops are now often delivered alongside essential services including nutrition support, primary health care and other vaccines. By identifying the overlap between what the polio programme has to offer and country-level priorities for strengthening health systems, we can make a lasting difference to global health overall, and significantly reduce the gap in the impact of infectious diseases between middle income and poorer countries. Since the GPEI was launched in 1988, Rotary and other volunteers have raised funds, built awareness, and advocated for their national governments to support polio eradication. A volunteer can administer the two drops of oral polio vaccine to a child, and participate in National Immunization Days, which attempt to vaccinate every child under five years of age in endemic or at-risk countries. Millions of health workers are also helping us reach children who have never before been vaccinated. Funding has already contributed to many important successes of our programme. In 2016, Rotary funded the work of 52,676 vaccinators and 2528 supervisors in Iraq to keep up strong immunization coverage. 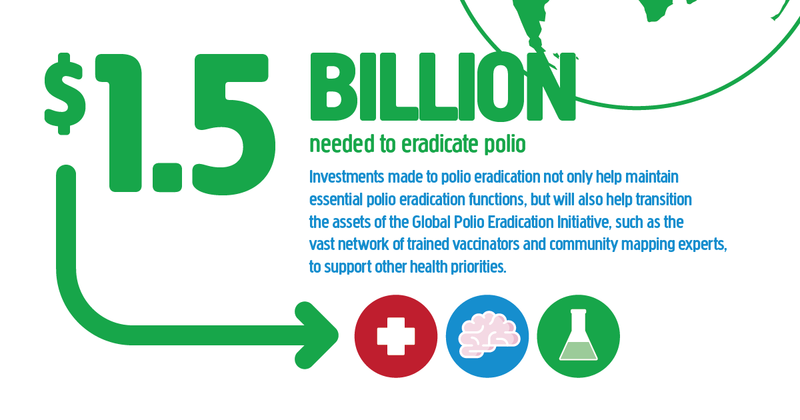 Investments made to polio eradication are also contributing to future health goals by documenting the knowledge, lessons learned and assets of the programme. Funds also make possible the programme’s extensive surveillance and laboratory network to tell us where polio does (and does not) exist – a painstaking task given only one in 200 cases of polio results in paralysis. This network is already instrumental for taking on public health challenges beyond polio, such as Ebola. While we undoubtedly still have work to do and funds to raise, we are confident in the good work of our volunteers and members to get us to our goal of eradication. Read and be inspired by their stories and successes here – a world free from polio is certainly within our reach. 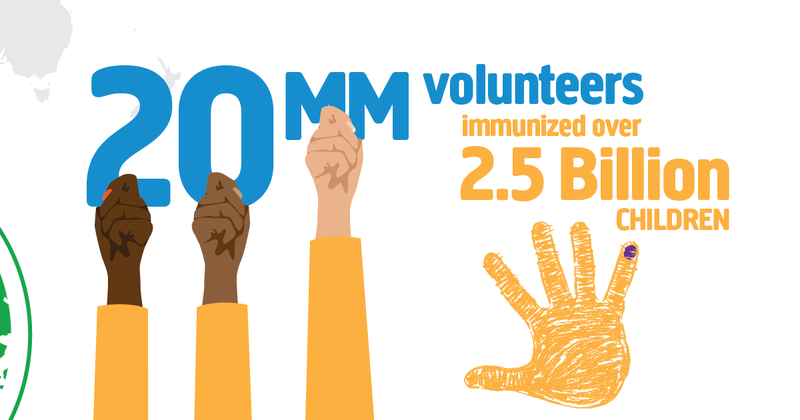 Immunization as a public health investment is incredibly good value. Every dollar spent on vaccinations in the US saves $3 in direct healthcare costs and $10 societally. 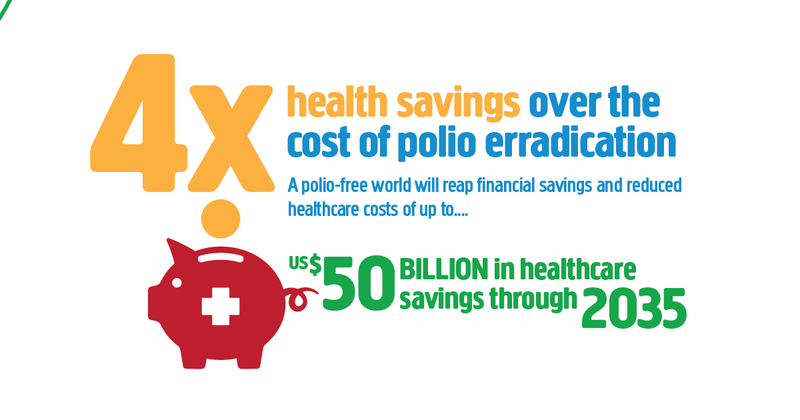 A polio-free world will reap financial savings and reduce healthcare costs by up to $50 billion through 2035. In fact, we’ve already saved $27 billion since the GPEI was launched, and low-income countries account for 85% of the savings, not to mention the immeasurable alleviation of human suffering. Conversely, if we allow polio to spread again, it would cost upwards of $35 billion more in treatment expenses and economic losses, so it’s a no-brainer that we have to commit all our resources to finish the job once and for all.